Posted on May 26, 2012 by David H.
Throughout Philadelphia, you’ll see the Japanese zelkova planted as a street tree, or planted in yards and parks, all over the place. If you go over by Norris Square in North Philadelphia, just south of the Square, along Howard Street, there’s a row of enormous zelkovas. Or if you’re in Chestnut Hill, at the triangle of green bounded by Ardleigh, Winston, and East Willow Grove, you’ll also see some large zelkovas. And just in general, if you go around the city, looking at trees, you’ll see plenty of Japanese zelkovas – they have dark grayish bark, somewhat rough, with an orangey tone underneath, that you can see as the bark above it peels away. Their leaves are toothed, and come to a bit of a point at the end – they’re shaped somewhat like the leaf on the Breyer’s ice cream logo. Their branches spread out somewhat, and their canopy makes a nice rounded shape. They’re tough trees that can live well in the city, and they also grow in an attractive habit – they look nice and they grow well, and so, they’re planted all over the place. The Japanese zelkova (Zelkova serrata) is an ubiquitous street tree in Philadelphia. It truly is magnificent – with its upwards reaching branches (that is, its fastigiate growth habit), it looks like a wild upended broom in the wintertime. Lush foliage in the spring fills its canopy with green that lasts through to the autumn, and in the winter, when it loses its leaves, the fastigiate habit makes for a wonderful structural element in the landscape. And its gray silvery bark, without the orangey-red underbark of the Japanese zelkova, gives it a subtly rich texture throughout the year. The branches also fuse with each other, making for an appearance like a strangler fig in the tropics, with the branching and anastomosing strands tangling into wonderful knots. This fusion is an interesting characteristic, and not wholly uncommon in plants. Plants are different from animals, in that they have far fewer moving parts than we do. For animals, cells move with respect to each other – they move around the body, they shift as organs develop, they die, they grow, they can even travel quite far from where they were initiated, for example in the case of blood cells. An animal cell did not necessarily grow up next to its nearest neighbor, they are moving around so much, and so they need to have a pretty sophisticated system of cell-cell recognition, to make sure that the cell nestled up against them isn’t a parasite, like a bacterium or fungus, as some of their neighbors may be. And so, we (animals, that is) have immune systems that are pretty good at differentiating self from non-self. This is good for reducing parasite load, however, it isn’t so good if you want to make a graft – hence the need for immune suppressing drugs when organ transplant surgery is completed. Plants, however, grow by stacking one cell atop another as they divide and grow, and these cells are cemented together the one against the other as they do this – they grew up next to their neighbors and they’ll live next to them for the entirety of their lives, and after they die, they’ll be stuck there still. And so, there has been less evolutionary pressure in plants for a tight recognition of self versus non-self – proximity does that job for them. This isn’t to say that plants don’t have immune systems – they do. But they are not as tightly controlled as ours, and this means that individual plants can fuse with each other much more readily than animals can. And this is something that we (humans, that is) take great opportunity with, everytime someone grafts a tree, or a rose. There is a downside to this, however, too, because it also means that diseases can flow from one plant to another, if a parasitized individual has fused with a non-parasitized one – this is what happened with the elms of North America, as Dutch elm disease arrived. The trees’ roots had fused under ground, as they grew the one against the other along streets and avenues of the towns of America, and if one tree got sick, then rapidly all the trees in a row got sick, as the causative agent of this disease, a parasitic fungus, traveled along those fused roots. And so, as with many things, there is a plus and a minus, advantages and disadvantages, to our respective immune systems, and how they spring from our differing developmental protocols, and how they then in turn affect that development as we grow. And due to that development that allows for that fusion, the rummaging branches of the Caucasian zelkova have a fairyland apperance – like a mazed tangle of upright hair, knotting together, and then unknotting again, reaching Rapunzel like, but towards the sky. When I first saw this tree at the Woodlands, the one that is pictured above, I’d thought it was very old, this enormous trunk. It is very very large, and I’d been told that the Caucasian zelkova, this species, was at the Woodlands in William Hamilton’s time. (William Hamilton was the Philadelphia gentleman and plant enthusiast who owned and cultivated the Woodlands up until the earliest part of the 19th century – he died in 1813, and there is a rich heritage of horticulture and natural history at the Woodlands that continues to this day) And so from the first time I saw it I assumed that this trunk was somewhere around 200 years old. Price does not mention if Sargent was successful with those grafts, nor if the legion of invited gardeners were successful with their cuttings, to propagate this tree, or even if they tried at all. And so, as I looked at this wonderful tree and wondered why something so spectacular wasn’t growing in yards and parks throughout Philadelphia, like its cousin Zelkova serrata does, I thought I understood – this was, I believed, a very slow growing tree, and perhaps difficult to propagate, and it would take a very long time for it to get to this magnificent shape and structure, and so there were pretty good reasons for it not to have been commonly planted, and this, I thought, was why we don’t see it very often around here. But I was wrong. Yes, the Caucasian zelkova was at the Woodlands at Hamilton’s time. This tree, this kind of zelkova, was brought into Europe from the Middle East in the 1780s by Andre Michaux, who had gone to Persia (what we would now call Iran) and collected it and brought it back to France. At about this same time, William Hamilton, owner of the Woodlands at that time, was in England, visiting from Philadelphia, collecting plants and sending them back home – those plants would not have included the Caucasian zelkova, since it would have only freshly been introduced into Europe. We’re not sure exactly how it got to the US, and to Hamilton’s estate. But it may well have been via Michaux – he certainly was at the Woodlands, and he ran nurseries up in Hackensack (in New Jersey) and down in Charleston (in South Carolina) through which he might have imported this tree, and so while we can’t say for sure, we can make a rough approximation that Andre Michaux may well have been the fellow to have brought this tree to us, when it arrived here in the earliest part of the 19th century, or the latest part of the 18th. There is a photo of one of those original trees, currently in the Samuel N. Baxter collection at Bartram’s Garden (it was shown to me by Joel Fry), with a photograph from the 16th of April, 1920, of Mr. Baxter (he was the chief arborist of the Fairmount Park system at the time) gazing up at at a large trunked (13′ 4″ in diameter!) fastigiate tree – an original Woodlands Zelkova carpinifolia, “just before tree died”, as a label on the back of the photo tells us. This provides further supporting evidence that those original Caucasian zelkovas are no longer there. And so, by 90 years ago, the originals were gone. This one we see now is a root sucker off them, one of the ones mentioned in Harshberger’s article from 1921, and it’s not more then 90 years old. And it’s enormous, and so it’s not so slow a grower. And so that is not why it is not planted commonly around here. But perhaps it can’t be propagated well, and maybe that’s why we don’t see it. Well, if we visit the McLean Library of the Pennsylvania Horticultural Society and look in catalogs from Meehan’s Nursery, a large one in Germantown, here in Philadelphia, we see that they had this tree for sale in the late 19th and early 20th century. While it’s not in their 1858 catalog, it is in the 1880 catalog, under the name of Zelkova crenata – under a listing for plants that were “1 to 2 ft”, they went for 50 cents a piece, which wasn’t cheap at that time. They didn’t sell them in bulk either, only by the piece, which suggests that they didn’t have a lot of them, or at least didn’t think they’d sell a lot of them. The latter theory is borne out in the 1893 and 1895 Meehan’s catalogs, in which Zelkova crenata is noted as being “Rare in cultivation”, and in the 1896-1897 catalog, in which it’s either upgraded or downgraded, I don’t know which, to being “…not common in cultivation”. Starting in the 1897-1898 catalog, it starts being sold under a different name, Planera richardii, and it was sold under that name for a few more years. However, by the 1911 trade catalog, it isn’t there, and in the 1911 retail catalog, Planera is only listed in the back, and it is not described, nor are individual species listed – they are only listed in a footnote as being “in stock”. The plant is not in the later catalogs – not in the 1916, nor 1917, nor 1923-1924. Its few decades of being sold by Meehan’s Nursery had passed. But it had been sold. This tells us that it can be propagated, and the tree at the Woodlands shows us how well it can grow, how strong it can grow in a city, and just how beautiful it can be. 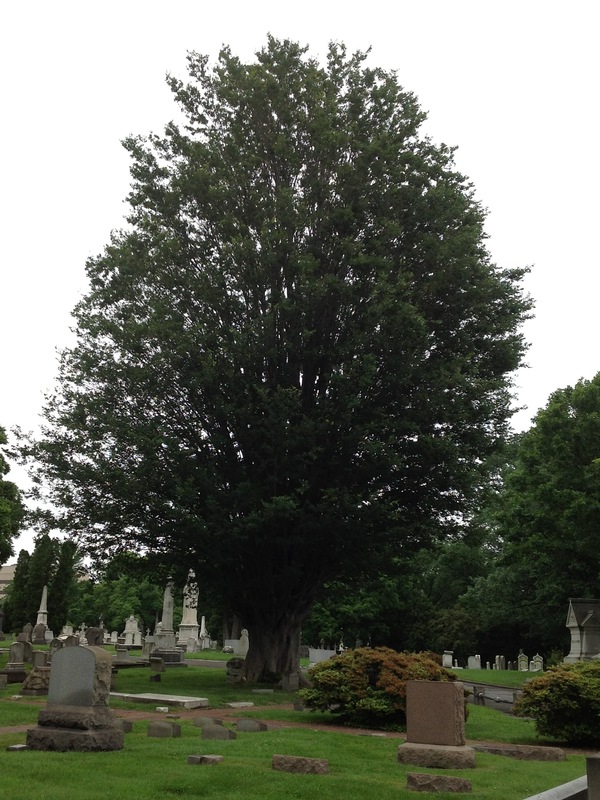 It’s a marvelous tree that can be propagated well enough to have been in the horticultural trade for a few decades, and it’s a tree that can grow quickly and live for a pretty long time, somewhere around a century, or a bit more, in a cemetery in the midst of one of the largest cities of North America (Philadelphia, that is). So why isn’t it planted more often? Why do we see it so rarely? The only other one that I’m aware of anywhere near to here is one near the Capitol building, on the National Mall in Washington, DC. Why aren’t there more of them planted in the cities and suburbs of the mid-Atlantic states? I don’t know. Its relative, the Japanese zelkova, is an extraordinarily common street tree in Philadelphia, but the Caucasian zelkova is not. But this is a tree that could be planted, could be propagated for sale and distribution, could be grown in parks and yards throughout Philadelphia – it’s a tree that we don’t see much of, but we could see more of. We just have to propagate it, plant it, and let it grow. Buzz around the blossoms: the beauty, importance and wonder of New Jersey’s native bees. Thomas Nuttall's "Genera of North American Plants, and a Catalogue of the Species, to the year 1817"